Have you ever tried taking a photo of a building only to have the building look like it's leaning backwards? That's a perspective problem known as keystoning, and it's caused by the building and the camera lens being on two different angles. Usually, unless you're fond of climbing trees or you have a friend at the fire department, standing on the ground and tilting the camera back a bit is the only way to get the top of a tall building into the photo, and since the camera is tilted away from the building when you snap the image, with the top of the lens being further away from it than the bottom of the lens, the building ends up looking like its leaning backwards. This problem actually exists any time you need to tilt the camera back to get something tall into the photo but it's most noticeable with buildings due to their straight parallel sides. Keystoning can sometimes be a desirable effect since it can add a real sense of drama to the image. However, there are times when you'll wish there was some way to correct this perspective problem, and Photoshop gives us a few different ways to go about it. Up until recently, we had a choice of using either the Crop Tool or the Free Transform command, but in Photoshop CS2, Adobe introduced the powerful Lens Correction filter which quickly replaced those other two methods as the fastest and easiest way to correct keystoning. 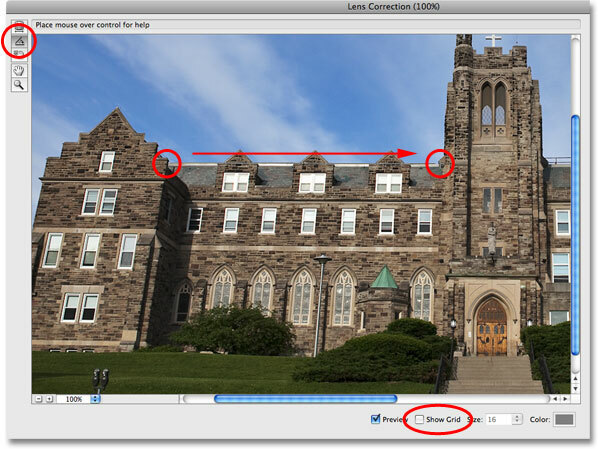 We'll look at how to use the Lens Correction filter in this tutorial. I'll be using Photoshop CS4 here, but any version of Photoshop from CS2 on up will work. The original image with the building appearing to lean backwards. Duplicate the Background layer to avoid damaging the original image. 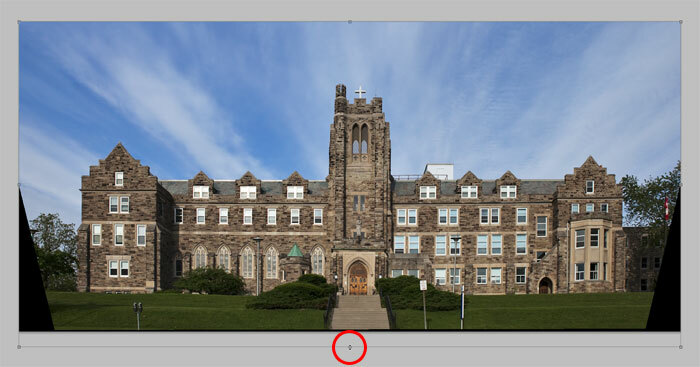 Click and drag with the Straighten Tool across something in the image that should be straight. If you need to zoom in on the image, press Ctrl++ (Win) / Command++ (Mac), or to zoom out, press Ctrl+- (Win) / Command+- (Mac). If, while zoomed in, you need to move the image around inside the preview area, simply hold down your spacebar which gives you temporary access to the Hand Tool, then click and drag the image to move it. Click on the Remove Distortion Tool, then click and drag inside the image to remove barrelling or pincushioning if needed. Drag the Remove Distortion slider towards the left to correct pincushioning or the right to correct barrelling. If you've gone too far and need to reset the image, just enter value of 0 into the Remove Distortion input box directly above the slider. Now that we've made sure the image is straight and we've removed any distortion, let's fix our keystoning problem. We'll do that next! 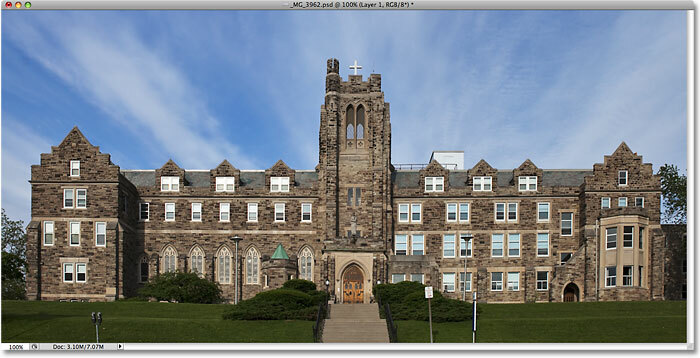 Compare the building sides with the vertical grid lines as you drag the Vertical Perspective slider. Stop when the grid lines and the sides appear parallel. 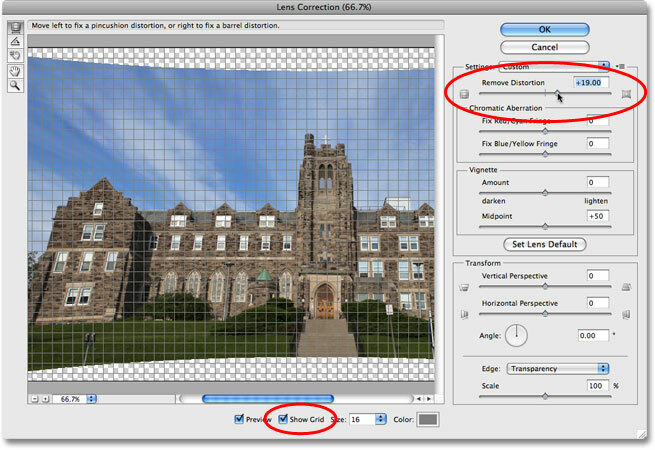 If you need to move the grid around to line it up with one of the sides of the building, select the Move Grid Tool directly below the Straighten Tool on the left of the dialog box, then click and drag inside the preview area to move the grid as needed. Move the grid around inside the preview area if needed with the Move Grid Tool. Choose either "Transparency" or "Background Color" for the Edge option. The sides of the building now appear parallel. Drag the bottom Free Transform handle downward to stretch the image vertically if needed, making the building appear taller. Drag a cropping border around the area you want to keep. Select Hide in the Options Bar to hide the cropped area rather than delete it. And there we have it! 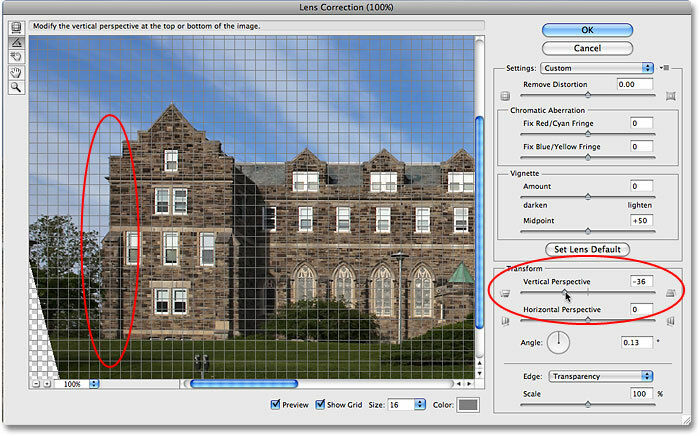 That's how to correct perspective problems in an image using the Lens Correction filter in Photoshop! Check out our Photo Retouching section for more Photoshop image editing tutorials!